Disaster for freedom of expression, EU startups, and a Europe without digital borders Tweet this! This leak confirms our worst fears. 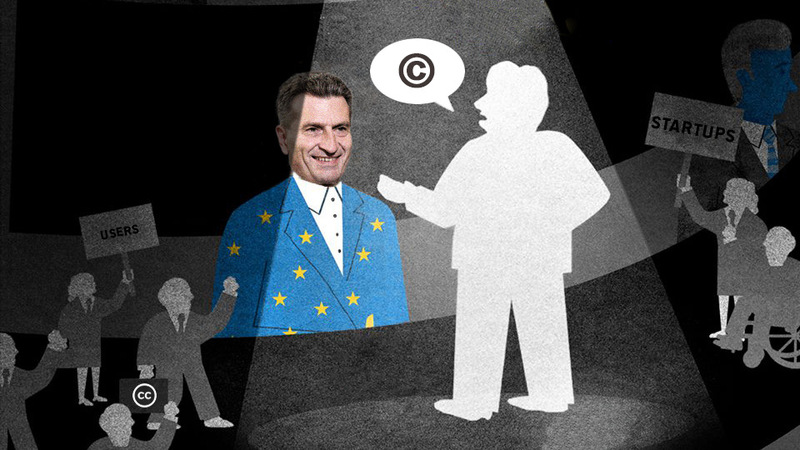 Commissioner Oettinger has let copyright reform be hijacked by the biggest players from the news publishing, film and music industries. Rather than a modernisation of the fifteen-year-old copyright framework we so desperately need, Oettinger is about to present plans to shield analogue industries from the digital opportunities they ought to be embracing. Not only will that backfire on these industries in the long-term, but the proposals would spell disaster for freedom of expression on the internet, European startups’ ability to innovate, and the cause of a Europe without digital borders. The planned EU-wide ancillary copyright for press publishers would make most ways of sharing even 20-year-old news articles illegal and thereby limit Europeans’ freedom of expression and access to information. Oettinger is doubling down at the EU level on an idea that has already failed with catastrophic effects in Germany and Spain – the definition of a fool’s errand. His plan to obligate internet platforms to scan all user uploads for copyright infringements will be the death knell for any European competition to YouTube or Facebook who will be unable to comply with this costly burden. Commons-based platforms relying on users’ voluntary contributions of pictures and texts such as Wikipedia will be collateral damage. This creativity-killing plan exposes the Commission’s lip service to startups and innovation as hypocrisy. Commissioner Oettinger appears to have turned a blind eye to just about everyone but the lobbyists: The appeals of 555,000 Europeans to introduce Freedom of Panorama across the EU have fallen on deaf ears – no action is proposed in this reform. Vice President Ansip’s insistence that the discriminatory practice of geoblocking ‘must be abolished’ was turned into an empty promise – Europeans will continue to encounter digital borders daily. Oettinger has failed to make meaningful progress on the tasks President Juncker had set out in his mission letter – to ‘break down national silos’ and ‘modernise copyright in the light of the digital revolution’. This is not a copyright fit for the digital age. It is a copyright that will hold European internet users back and drag European startups down. If this is the best our Digital Commissioner can come up with after years of preparatory work and debate, he is unfit for this office. It is easier to make a new Europe than to change the old system.